TORONTO — More than three decades after "The Handmaid's Tale" hit shelves, Canadian literary great Margaret Atwood is writing a sequel to the timely dystopian tale, which she says is partly inspired by "the world we've been living in." 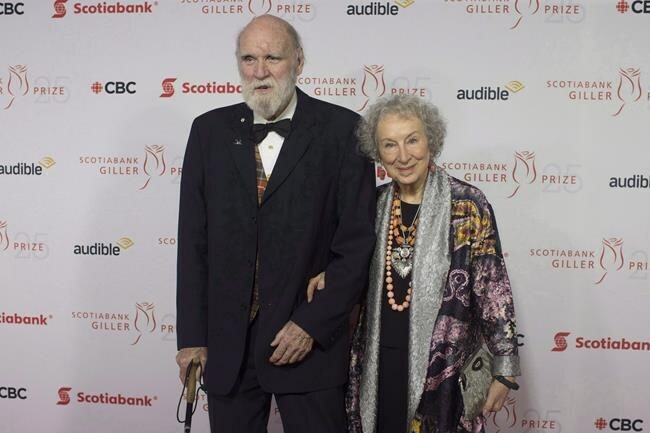 "The Testaments" will be published "across the English-speaking world" on Sept. 10, 2019, Toronto-based publisher McClelland & Stewart said Wednesday. First released in 1985, "The Handmaid's Tale" was shortlisted for the Man Booker Prize and won a Governor General's Award with its look at a totalitarian society in which women are treated as a property of the state. Eight million copies have been sold globally in the English language. The story inspired the hit Emmy Award-winning series of the same name, starring Elisabeth Moss as protagonist Offred, who is enslaved in a commander's household and forced to bear children for him and his infertile wife. The series, which debuted in 2017 and airs on Bravo in Canada and Hulu in the United States, is shot in Toronto and has helped push the book back onto the New York Times bestseller list. Other cast members include English actor Joseph Fiennes as the commander, and Amanda Brugel of Pointe Claire, Que., as a prominent household servant in the Republic of Gilead. "The Testaments" is set 15 years after Offred's final scene in "The Handmaid's Tale" and is narrated by three female characters, said McClelland & Stewart. "Dear Readers: Everything you've ever asked me about Gilead and its inner workings is the inspiration for this book. Well, almost everything!" Atwood, who lives in Toronto, said Wednesday in a statement. "The Handmaid's Tale" has been touted as an eerily prescient cautionary tale as protests and marches about the rollback of women's rights have unfolded in various parts of the world since the election of U.S. President Donald Trump. The TV series, which is now filming its third season, has also inspired some protesters to wear the signature red hooded cloaks and white bonnets of the characters in public as a symbol of female empowerment and resistance. McClelland & Stewart says "The Testaments" is not connected to the TV series. "As the enormous recent success of 'The Handmaid's Tale' has reminded us, Margaret Atwood is one of the greatest writers and most relevant thinkers of our time," Kristin Cochrane, CEO of Penguin Random House Canada, said in a statement. "To return with her to Gilead is a rare gift, and all of us at Penguin Random House Canada and McClelland & Stewart are very proud to continue our long relationship with Margaret, and excited to publish this brilliant next chapter in a story that has captivated Canadian readers for decades."